Well here I am as usual writing this post as I sit in bed with a cup of tea, delaying the moment I must get up and get cracking. Just like millions of other people in the world I spent yesterday listening to David Bowie’s amazing music while I worked – and now this morning the name of this salad immediately made me think of Jean Genie. I don’t know what to say about Bowie, every news media is full of stories of his life and endless pictures of his transformations. All I can think of is – he was truly cool, unspeakably cool – the coolest – but also incredibly it seemed from a distance he was truly lovely too. Argh – must get up, must get up!!! Every year I throw myself heart and soul into the spirit of Christmas, in particular the aspect of eating and drinking whatever I fancy because, hey – it’s Christmas! Then, about now, everyone around me is getting busy with their New Year’s resolutions and I think it’s probably (well overdue) time to get back to my regular pretty healthy eating – and these recipes that I put together for Fairfax deliver just what I’m after. 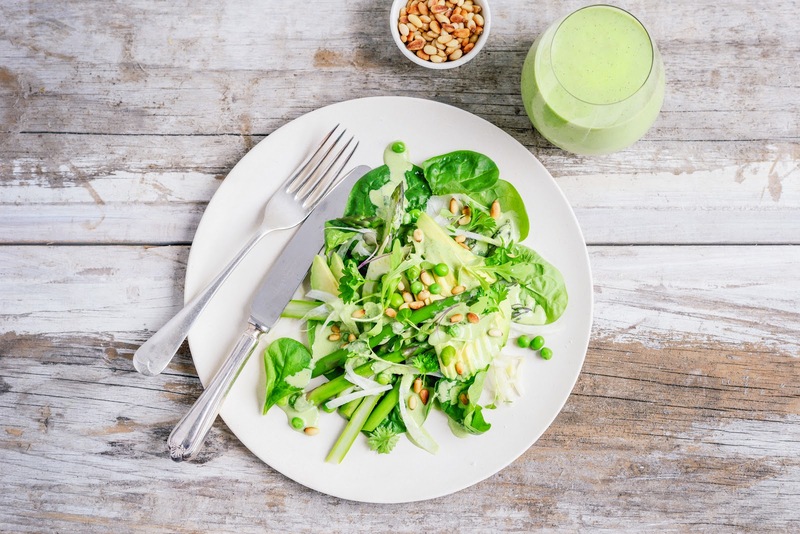 The salad is a green celebration – aniseedy fennel, just-cooked asparagus, iron-rich spinach, fresh baby peas and creamy avocados, drizzled in a zingy, herby dressing and sprinkled with toasted pine nuts (or almonds) for textural crunch – yuuum! Meanwhile the smoothie tastes amazing – the natural sweetness of the fruit is a great reminder that Mother Nature provides so much goodness, right from the tree/bush/vine! God, now really must get up – tomorrow I have a 4:15am start to get to the airport for a 5:30am flight to Wellington so that I can share the driving back up with Henry – holy moly, it’s all go. Then Friday I am doing a wee workshop with the good folk at My Food Bag – should be fun – and meanwhile I’m shooting Italian desserts for Dish…and flying to Shanghai next Wednesday. Breaaaaathe. Move! Roughly chop ½ cup basil, ¼ cup mint and ¼ cup parsley and whiz in a small food processor with fennel tips, garlic, yoghurt, lemon zest, feta and water. (Thin to desired consistency with more water if desired). Bring a pot of water to boil and drop in the peas, cook for 2 minutes then drain under cold running water. Repeat with asparagus and refrigerate peas and asparagus for half an hour. 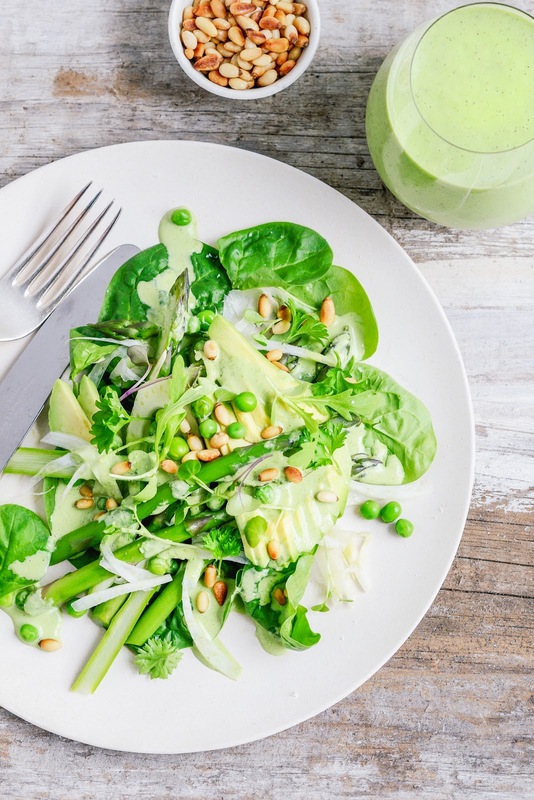 Toss peas and asparagus with spinach, avocados and fennel. Drizzle with dressing, toss gently and sprinkle with pine nuts, remaining herbs and micro greens if using, to serve. It looks so yummy. I can't eat it. beacause it is beautifull. My family loved the recipe.. We will try a different one next time. This is a great recipe. I like salad recipe. I will try it soon. Thank for share ! This recipe looks great and I love how it tied you to your memories in college.